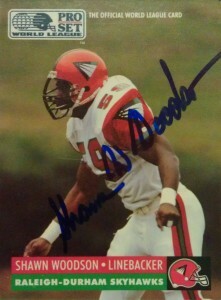 Shawn Woodson played linebacker for tiny James Madison University from 1985 to 1988. He finished his career at the I-AA school with 341 tackles and 15 sacks, and as a senior earned second team All-American Honors. Shawn was tabbed by the Minnesota Vikings in the 12th round of the monstrous 1989 NFL draft. Although he didn’t make the roster, he signed with the Toronto Argonauts of the CFL, and saw action in one game. Released in the preseason again by the Vikings the following year, Woodson was then taken by the Raleigh-Durham Skyhawks in the second round of the linebacker portion of the 1991 WLAF draft. He’d room with defensive stalwarts Jon Carter and Patrick McGuirk while with the Skyhawks. The Skyhawks set a record for futility going 0-10 that season, -translating to the defensive unit getting plenty of time on the field. Woodson was second on the team with 3.5 sacks, 65 tackles, and 3 quarterback hurries. After the season, the Skyhawks were disbursed by the league- perhaps mercifully. He’s married now with 2 kids and lives in Virginia, where he owns a PostNet location. Google came to the rescue again, as Shawn has a pretty unique name and university combination, helping me knock out another member of the elusive Skyhawks brand.